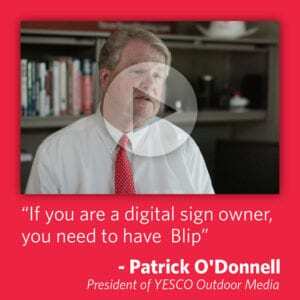 Greensigns operates a network of digital and static billboards in the Chicago area. Joseph Mancino is CEO. David Williams is President. The company’s green commitment is demonstrated in three ways. The company purchases renewable energy in order to power its signs. The company also uses efficient Ad-tech FTX billboards to minimize power consumption. The sales department is virtually paperless. The company uses 100% recyclable polyethylene Eco-Flexx vinyl on its static billboards. Eco-Flexx has a carbon footprint that is 60% less than conventional vinyl and is chlorine free. Insider interviewed CEO Joseph Mancino. How did you enter the out of home business? It was 1986 and I was selling business telephone systems after the mandated Bell breakup. I was attending college at night, working sales during the day. One week I watched as a billboard was being constructed on the property where my office was located. Once it was completed, I decided to call on the company who constructed the billboard – 3M National Advertising. After spending 3 months or so selling them a phone system for their offices, I was asked by the regional manager if I would ever consider selling billboard advertising. A couple of interviews later later I was hired, and 31 years later I am still in love with this business. Chicago has taken a more welcoming approach to digital signs than many cities. Why is this? That is a very interesting question – because I disagree and agree at the same time with your ascertainment. While the Chicago market as a whole has welcomed digital technology in out of home, the City of Chicago only did so recently and with exclusivity. In the city proper, there is what I believe to be an unconstitutional condition by which only one company is actually allowed to erect and operate digital billboards in the city. 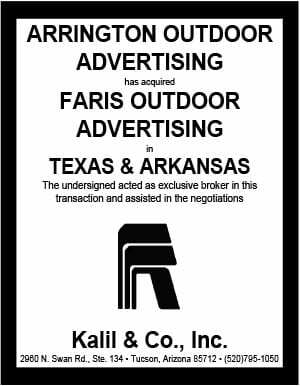 This came after a deal was reached with that company in 2012 to erect digital billboards on city owned properties. An ordinance was written and passed by city council specific to these billboards that are on city owned property and operated by only one billboard company. While those billboards are allowed, no one else is allowed to erect, convert, or otherwise operate traditional digital billboards in Chicago. So the short answer is yes, Chicago was welcoming to digital signs. Right after they got their piece of the action. You were installing smaller digital signs at one point. Are you still doing this or are you focused just on big signs? That is correct, we are only focusing on large format digital sign development at this point. Interestingly when the city of Chicago struck their deal to have one company exclusively develop large format digital billboards in the city they also passed a new ordinance that largely prohibited us from continuing to develop our small digital sign network. Are the two actions related? That is a point that can be argued both ways. Who’s digital signs do you use and what have you learned. We use digital signs from both Watchfire and Formetco. We have learned that not all products are the same, and that LED technology is changing so rapidly you can never keep up. We are constantly seeking the best looking/performing product, while keeping true to our green roots – energy efficiency. We have also learned that third party operating software is key in customizing our operations and creative execution on the signs.